On the drizzly, damp morning of July 24, 1911, Yale professor Hiram Bingham was leading an expedition through the jungles of the Andes Mountains in Peru. He was searching for the last two capitals of the Inca Empire, Vitcos and Vilcabamba. Instead, with a young local boy leading the way, Bingham happened upon what was later honored as one of the new New Seven Wonders of the World. Bingham and his two companions had been told by local farmers and an innkeeper by the name of Melchor Arteaga about ancient ruins in the mountains. After climbing a surprisingly short two hours, they encountered a small grouping of huts. A young native boy agreed to lead them the rest of the way. Suddenly Bingham’s party found themselves surrounded by ancient ruins as breathtakingly splendid as any found in Peru. The area was called Machu Picchu, or “Old Peak”. The great civilization of the Incas in southern Peru dates back to around the 13th century. In the region around Cuzco, the Incas conquered the other tribes and built an empire that included an estimated 6-12 million people. It was very likely the largest empire in the indigenous Americas before the arrival of the Spaniards. Weakened by Civil War, the Incan Empire fell to the Spanish conquistador Francisco Pizarro in the 1530s. 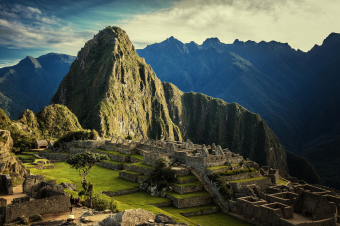 It’s assumed the Spanish never knew about Machu Picchu as the site appears to have been mostly left undisturbed, unlike other Incan towns the Spanish plundered. Bingham had several theories as to Machu Picchu’s purpose, including a safe haven for the women of the royal family, or a military installation. Many modern historians believe it was built by the last Incan leader, Pachacuti, as a retreat for himself and the other elite. Beyond the controversy over what the site was used for, it’s also been disputed that Hiram Bingham was the first to discover what was heralded by the New York Times as “The greatest archaeological discovery of the age.” Peruvians contend that Bingham was not the first European to set foot on Machu Picchu and that other British, American and German explorers had gone before him. Further, many locals seem to have been well aware of the site, and Bingham himself observed local farmers using some of its agricultural terraces when he first arrived there. But it would seem none of them understood the historic significance of the site. In fact, Bingham’s own son, Alfred, contends that, contrary to what his dear old dad would later say, according to letters his father wrote to his mother from the time, Bingham didn’t appreciate what he’d found at first either, spending only an afternoon there before leaving to continue his search for Vitcos and Vilcabamba- perhaps being unenthusiastic about the site at first owing to the fact that there were people living so close to it and it seemed well known by the locals. Alfred states that it wasn’t until his father asked around and learned that, outside of certain locals, nobody seemed to know anything about the site that he became really interested in it. Whatever the case, Richard L. Burger, a professor of anthropology at Yale University, asserts that Bingham “never claimed to have been the first modern person to have set foot in Machu Picchu.” Some people in Peru refer to Bingham as “the scientific discoverer of Machu Picchu,” which is a reasonable enough compromise.